The marina and channel at Heaving Down Rock, Providenciales. The Bird Rock area at Heaving Down Rock, Providenciales. The Heaving Down Rock area is found on the east end of Providenciales. The main point of interest here is the Caicos Conch Farm, and Heaving Down Rock Marina (Walkin Marina), which is the launch point for the North Caicos and South Caicos passenger ferry services. It’s easy to get to this location. Simply follow the paved Long Bay Highway (the continuation from Leeward Highway at the Grace Bay roundabout) to its termination at Leeward Going Through channel. You'll be able Mangrove Cay directly across this waterway. This region offers some of the best shore fishing on Providenciales. 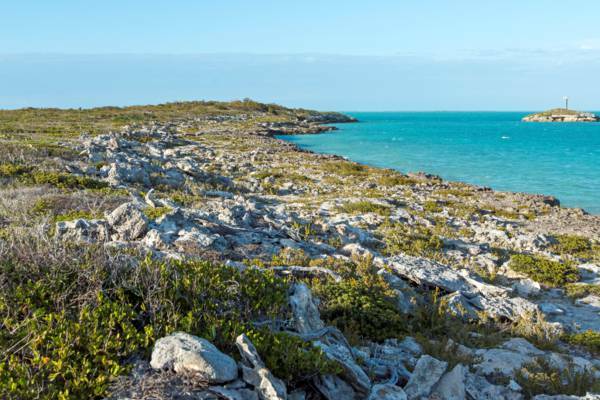 Bird Rock Trail, a .8 mile (1.3km) hiking path that’s managed by the Turks and Caicos National Trust, is located in the Heaving Down Rock area. This trail begins in the dry forest common to the country, and gradually leads into marine salt marshes. At the conclusion of the trail is Crist Point and the tiny isle of Bird Rock. The low coastline here is quite interesting in that it exhibits rocks piled by the power of the ocean. The events that moved these rocks must have been incredible, as the ocean conditions of the shallow Caicos Banks fronting the south of Providenciales may be quite choppy at times, yet generally never exhibits large waves. It’s likely that a tremendous storm caused this damage, such as the 1866 Great Nassau Hurricane.